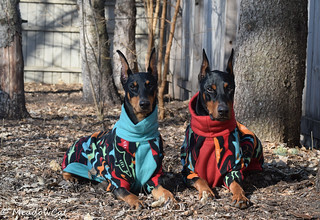 Doberman Forum : Doberman Breed Dog Forums > Doberman Specific Chat > Doberman Health > Which vaccines to continue? Ace got all of his vaccines last year. Obviously he will always get the rabies shot, and definitely the bordetella shot since we will probably have to board his again this year. But how do I know which others to continue? It seems like a lot, honestly. We do have a bit of swamp like areas behind the house, which is why we opted for the Lepto last year. We also live in an area where Lyme disease is prevalent, and my parents dog now has it. So that made sense. But am I really giving him all of these vaccines ever year, without question? Dobebug, would love to hear your recommendations also. I follow Dr. Jean Dobb vaccine protocol https://www.animalhealthfoundation.n...cine-protocol/ Dax has not received vaccines in 4 yrs. only Lepto. She continues to have antibodies. Rabies you don't have a choice but you can do titers for some, and others, you may just want to decide if it's worth continuing. That would depend how much your boy is around other dogs or hiking, camping etc. OK, Cresa--this will be good for a laugh. I'm the queen of "Keep the vaccines to a minimum"...but in your (well, Ace's) case I'm going to recommend that you do most of them. Here's why..
Rabies--no choice--every state has regulations about rabies but at least most of them also only require after the first (usually good for one year) and the second which will be a three year one it becomes an every three year deal. Ace is probably getting his second rabies vaccine this year and then won't have to get one again for three years. But check your local regulations. DA2PP--this is one I give yearly or I do titers (for distemper and parvo--there isn't one for the other P) I maybe I should say I used do titres until the cost went sky high--when it got to be three times as much as the vaccine cost I did the vaccines. And I do this until the dog is 5 or 6 and then I don't do that vaccine--my dogs are active in a bunch of stuff--they go places and are exposed to other dogs and their immunity levels stay high--if they were stay at home in the yard dogs--these are dogs who sometimes end up with no immunity and suddenly get taken someplace where there is a dog with one of these things and then you have a sick dog--but I've been doing it like this for 30 or 40 years without issues. Lepto--In your case with a swamp behind your house AND the fact that for a long, long time the Eastern Seaboard was practically an epidemic area for Lepto and even though Lepto has many serovars and is likely to mutate easily and rapidly so sometimes the vaccines don't cover the type of Lepto in your area it's considered caution to vaccinate. My state only had two reported cases of Lepto four years ago and not anywhere near me. Most of the PNW is not at risk so I don't vaccinate for Lepto. Lyme--sort of the same story as Lepto for you--if Lyme is prevalent in your area--vaccinate for it--various vets have told me that the Lyme vaccine isn't as effective as they'd like it to be (like 100% is what they want) but it's a lot better than nothing and tick borne diseases are ugly--hard to identify and hard to cure. Lyme is basically a no issue for the PNW because we don't usually have the type of tick that carries it--but we have other types of ticks and although some do carry diseases that can be transmitted to dogs it's not so much a issue--if your dogs regularly are in brush areas there are ticks and prevention consists of keeping ticks off the dogs. I'm not even sure that there is a vaccine for the most common tick borne disease around. Influenza--I don't know what to tell you about Influenza--seems to be more common east of the Rockies although there have been a few affected dogs here on the Pacific coast. I'd talk to my vet about it--I know some who seem to think if the dog has had the two vaccine series that you don't need to do more and others who think you should vaccinate each year. It is a lot--and the best thing to do where you have decided to give several vaccines I'd divide them up. Give maybe the DA2PP and bordetella at the same time--they've been giving those vaccines at the same time without horrible side effects for a long time so it's probably safe. Rabies I would give alone and not within a very minimum of one week after and one week before any other vaccines. Lepto is famous as a reaction producer--I would not give it with other vaccines and I'd want to keep it like rabies separated by at least a week before and a week after any other vaccines. I don't know enough about Lyme to suggest anything about and I'd rely on my vet to tell me what he thought about it. Good luck-I'm sure glad we are still relatively free of some of the deases that should be vaccinated for out here in the PNW but we have acquired a number of things that didn't exist here before the national highway system was developed--hook worm, whip worm, heartworm just for a few. One of my very firs vets was telling me he'd found whip worm in a dog who came in from Florida--he said (this was in 1960) he'd never seen a live whipworm and had only seen pictures in books or in prepared slides when he was in vet school. I do rabies as required by law, booster distemper at one year, we get lepto and flu around here, only do bordatella when required. My vet and I don't feel the efficacy of the lyme vaccine is high enough to be worth it, but I do ponder it. I personally just can't be on board with much with Dr. Dodds anymore, since she's decided to throw out the scientific method, so I don't put much stock in what she says. I didn't really get into it but it worth going to the AAHA site--they worked out a reasonable three year rotation plan which we (with some modification) us. The DA2PP is manufactured as a 3 year vaccine and if your clinic follows the AAHA recommendation you can get your dog vaccinated in a schedule so that they get rabies on the first year of the rotation, they get a DA2PP on the second year and something--bordetella probably on the third year. Then the rotation starts again--this would start the year the dog gets his 2nd rabies vaccine. And if you are giving a reactor like Lepto which gets given yearly--you'd wait 2 or 3 weeks after either the rabies or DA2PP was given and give it then--ditto for Lyme. I wasn't going to get into the Dr Dodds thing but I probably should. I sort of wrote her off when she continued to insist that the ONLY proper test for genetic status of vWD was a Elisa Assay (which really only measures vWD factor circulating in the blood at the time of the blood draw. And she continued to insist that was the case and that the vWD genetic test offered by VetGen wasn't peer reviewed and not accurate. Thanks for clarifying all of that...I should have taken a bit more time in my response. I also wanted to add that I don't give all those vaccines in one visit. I like to spread them out. I discuss with my vet, and we figure out what is best for my dogs given their lifestyle/exposure. And maybe I shouldn't have commented about Jean Dodds, but I just couldn't help it...her name kind of makes me twitch now. I am very cautious about vaccines. I always give parvo/distemper and rabies but only give bordetella if necessary i.e. my dogs are going somewhere with other dogs and I’ve always only given the nasal version, however my vet now recommends a nasal followed by an injection booster. I don’t know what to think about this. I never give lepto, due to the high chance of reaction and it not being prevalent here, also from what I understand it doesn’t protect for very long. As far as influenza, I’m on the fence....there was a major outbreak in Ohio (I live just over the border in Michigan), I’ve never given it but I’ve thought about it and discussed with my vet. I always spread out my vaccines and only give one injection vaccine at a time, although I will give a nasal bordetella with another. Also, I had a dog get a nerve injury from a rabies vaccine and while it is extremely rare, I never allow vaccines in the rear legs anymore. Shew, I almost forgot I posted here. Life has been chaotic lately! Ace is really not enjoying the fact I am taking three online college classes trying to finish up my degree. He shuts my laptop with his head as frequently as he can. OK, Chesa--this will be good for a laugh. I'm the queen of "Keep the vaccines to a minimum"...but in your (well, Ace's) case I'm going to recommend that you do most of them. Here's why..
Dobebug, I am so glad to have access to your advice. This makes me feel MUCH better. I preemptively gave Ace the bordetella vacc at the last visit, knowing we will be going away on vacation in the next few months, but I have not seen your opinion of it. I haven't been able to browse the threads here as often as I'd like anymore. My new vet is wonderful, but a little expensive. So I am going to be hitting up the local PetVet clinic's at Tractor Supply for vacc's when I can. They are usually much more reasonable, but it did blow my mind when the titer's were triple the cost of the actual vacc. After our miserable experience with vacc's last year, definitely going to be spacing these out!